(CNN) - In a moment that Mitt Romney's future GOP opponents couldn't have scripted better themselves, President Obama Monday issued a full-throated embrace of the former Massachusetts governor's stance on health care. "I know that many of you have asked for flexibility for your states under this law," Obama said during a speech to a governors meeting at the White House. "In fact, I agree with Mitt Romney, who recently said he's proud of what he accomplished on health care by giving states the power to determine their own health care solutions. He's right." The universal health care plan administered under Romney's reign is among the former governor's biggest vulnerabilities as he weighs a second presidential bid. Critics maintain it will be difficult for Romney to attack the president on the health care law deeply opposed by most conservatives when he himself instituted a similar plan. 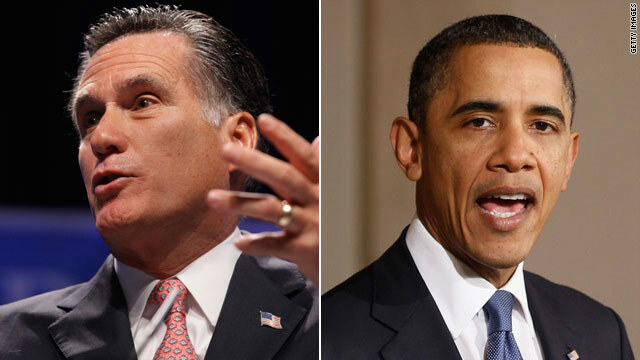 But Romney has defended the Massachusetts law, saying it was meant to be a solution for his state only. "We addressed a problem in Massachusetts that was designed to solve problems for the people of Massachusetts," he said recently. "But it is wrong and unconstitutional to take what is designed for one state and say we are going to apply that in every state." Still, the president and his surrogates aren't passing up the opportunity to tie Romney – considered among the early frontrunners for the GOP nomination – to the issue that has proven so unpalatable among Republicans. In addition to Obama's comments Monday, current Massachusetts Gov. Deval Patrick, a longtime Obama supporter, told ABC Sunday that "One of the best things [Romney] did was to be the coauthor of our health care reform, which has been a model for national health care reform." And earlier this month former top Obama advisor David Axelrod said of Romney, "We got some good ideas from him." To all of you who are against the health care bill. Nobody is making you take out insurance from one particular company. You get a choice. Wait until you don't have insurance and something happens to your health and you lose everything because you went bankrupt because of hospital bills. Good luck to you then. The best thing to secure Obama re-election happened when the tea party lunatics got the gop the house so they can remind the voters that their main agenda is to weaken the middle class and re-distribution of wealth to the few. I can see why you call yourself as "Four and The Door". That's where you want to be and you will be when you also say "Romney 2012"! Eat his election... there is no cost to you for buying it but there will no money to you (you will be unemployed) for buying the real food.. Yes. Obama's move was brilliant politically, but would you want a president incapable of tough brilliance? Although I voted for Obama, I hated the slow beginning of his presidency. I wanted him kicked out of office by any means possible. Now, he amazes me more each week. He moved to the center after we spoke forcefully to him last November 2. He is willing to both flex and extend on health care. He kept some promises. He even read up on Reagan, they say. I wish he'd pick up a copy of Atlas Shrugged, but I'm sure he read Rand and Nietzsche before rejecting them. It was a different time: demographics have changed, and so have mentalities. Just look what unions have done to our country. Obama has to govern the country as it is now. Not one Republican they've put up so far–including the two best-looking, Romney and Palin–could do as well as Obama is doing. I'm going to vote for Obama again. If he keeps this stuff up. @ Liam – not sure where you're getting your information, but it's not correct. Massachusetts is indeed in bad financial shape, but it's not due to anything Romney did. When Romney took office, he faced a multi-billion dollar budget deficit. Within a few short years, he turned that deficit into a $500 million surplus. Sure, the healthcare reform he passes here is a joke, doesn't really make healthcare affordable, but rather illegal to not have it – you are fined on your state income tax return if you don't provide proof of coverage for a 12 month period. But the financial condition of this state has worsened because of Governor who took office after Romney – Obama's best good friend Deval Patrick. The man LOVES to spend. Within a week of taking office he purchased $35,000 in curtains (curtains!) for his office, ordered himself a brand new Cadillac, and hired an assistant for his wife (his wife!) who has NO official role – the asst. being paid a salary of $75,000 a year. We (the taxpayers of MA) pitched a fit! Patrick also did thing like....oh, hand over $58 million of taxpayer money to a solar energy company (Evergreen Solar) to stay afloat, under the guise of "it will create jobs in MA" Well, Solar Evergreen announce a few months ago it can't stay afloat, closed it's main factory in this state, eliminating 500 jobs and sent it's manufacturing facilities to...China. Thanks pals! $58 million down the drain and hundreds of jobs from MA went to China. That would not have happened under Romney – he doesn't play Sugar Daddy to failing companies that leave the state and/or country after receiving 58 MILLION in "bail out" funds.